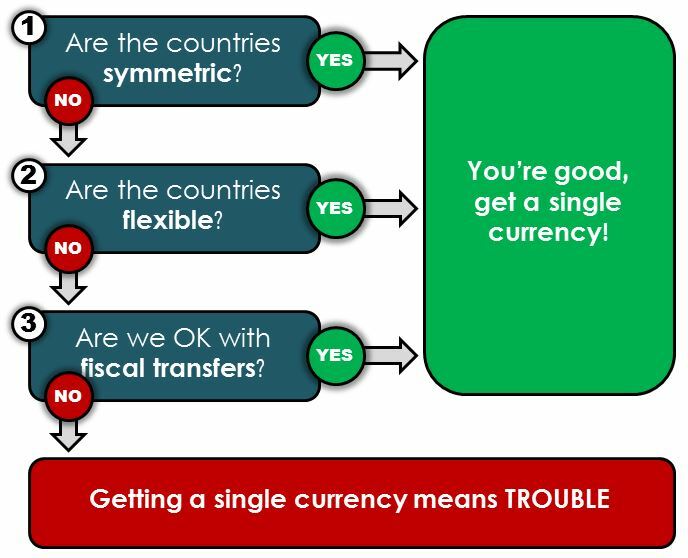 For two (groups of) countries that consider adopting a single currency there are advantages and disadvantages compared to a situation with two currencies. Crucial advantages can be an increased ability to borrow on financial markets, lower inflation expectations, and lower currency exchange rate risks. The biggest disadvantage is that a country no longer has full authority over its monetary policy. It cannot fire up the printing press and create money, which means that it cannot have government debt levels above a certain threshold and it cannot depreciate its exchange rates if it wants to boost exports relative to imports. The more this is a problem for a country, the bigger the disadvantage (or the costs) of a single currency. So when is this a problem? If countries are symmetric, it means that their economies experience similar cycles and have similar strengths and vulnerabilities. For instance, if two countries’ entire economy consists of car manufacturing, they are symmetric. If one country’s economy is about car manufacturing and another country’s economy is about manufacturing steel for these cars, then they are symmetric as well. If economic structures are very different, they are influenced by different dynamics. Every now and then, they will be hit by so-called asymmetric shocks: a development that hits once country more than others. For instance, if steel prices would spike 50% in one day, a car manufacturing country will be hit more than one that specialises in tourism. Asymmetric shocks are of tremendous importance. Traditionally, if a country is hit heavily by a certain shock, whatever it may be, it can use monetary policy to help deal with the shock. This could mean expanding expenditures (e.g. subsidies to the steel industry) to deal with the shock, and printing money to pay for it – but if you have a single currency, you cannot do that anymore. Considering Greece and Germany (or the rest of the Eurozone), it is easy to see that their economic structures are completely different. Germany has big sectors of heavy industry, whereas the Greek economy depends more strongly on tourism. Germany’s governmental infrastructure is well-developed, with low levels of tax evasion. Greek government is haunted by a low tax base and corruption. We thus know that it was a matter of time until significant asymmetric shocks would occur. A country is flexible if it can absorb and adapt to asymmetric shocks by internal institutional adaption. For instance, if the car industry is hit by higher prices for steel, they may be able to lower wages to protect their competitive position. Labour market flexibility is particularly important here. Being able to quickly decrease or increase (real) wages helps absorbing asymmetric shocks. Similarly, having the ability to move labour to more promising sectors (e.g. from the car industry to agriculture) helps to deflect the impact of such shocks. Although the bankruptcy of the city of Detroit in the U.S. had severe implications for the city, many of its workers were free to leave the city and find employment elsewhere. They had the same freedom to do so when their car industry slumped, which relieves social misery but also creates room for new sectors to flourish. For Greece this is of course not an acceptable option – they won’t accept an exodus of its brightest minds as a natural reaction to an asymmetric shock. Greece also lacked the flexibility to internally deal with the asymmetric shocks that hit them. They are and were unable to lower their wages or to cut pensions. Greece does not have the flexibility to deal with severe asymmetric shocks. Government budgets are drafted at least a year in advance. Assume that a government planned to have government expenditures worth $100 billion, but an asymmetric shock depressed its economy during the budgetary year. Tax income is now expected to total $80 billion. It might decide to keep expenditures at a higher level, running a deficit. Investors will only lend money against high interest rates (aggravating the problem) because there is a risk of default as the country cannot print its way out of trouble. If monetary policy cannot be used to absorb asymmetric shocks and if the country is unable to reorganise itself effectively to regain competitiveness, help must come from somewhere else. The only remaining way is to receive financial aid from other countries. Not loans, but ‘gifts’. Countries in a single currency zone will only accept this if there is enough (social) solidarity; that is, Germans would for example not mind paying for the Greeks. This social solidarity has never been sufficiently present in the Eurozone. The bailout Greece received in 2011 was not an act of solidarity – the alternative, which at the time seemed to be the collapse of the Euro altogether, was just worse. We thus conclude that in the case of Greece and the Eurozone, we were bound for trouble, and we knew it from the start. If Greece were to exit the Eurozone, the remaining group of countries is not all of a sudden a so-called optimum currency area. Spain’s economy is absolutely completely different from the Dutch and Finnish ones. So trouble is bound to keep coming if we retain the Eurozone in its current configuration (with or without Greece), without flexibility and fiscal transfers to compensate for a lack in symmetry. This entry was posted in Economics, Politics and tagged Euro, finance, Greece, monetary policy, politics.